Team spirit isn't the only thing that grows in locker rooms. Shared towels and equipment are a haven for bacteria. 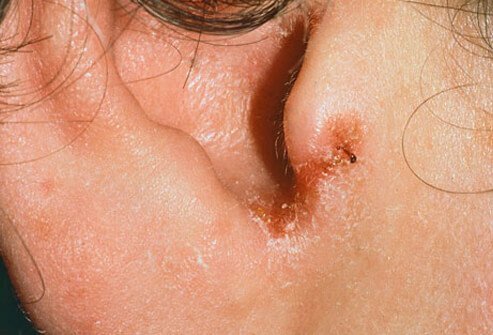 One type, called MRSA, or methicillin-resistant Staphylococcus aureus, causes painful, pus-filled sores and can spread from one person to another. MRSA is resistant to many antibiotics and requires special treatment. To protect yourself, avoid sharing towels, razors, uniforms, and other items that touch your skin. This itchy, scaly patch of skin is not caused by a worm at all. The culprit is a fungus (tinea). 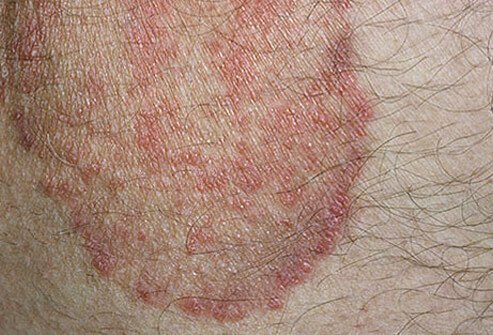 Ringworm is contagious, easily spreading through skin-to-skin contact and shared clothing or equipment -- even through pets. Most cases are easy to treat with antifungal creams. On the bright side: you can tell your teammates, "there's a fungus among us." When the tinea fungus sets up shop in the groin or inner thighs, it's called jock itch. But the infection doesn't only strike jocks. It typically develops with a lot of sweating and friction. Symptoms include a raised rash with scaly border that may be wet or blistered and itching. It's rarely severe, but can last for months if not treated. Keep the area clean and dry and apply over-the-counter antifungal creams. Athlete's foot comes from tinea fungi that thrive on damp locker room floors. Unfortunately, tinea pedis also thrives on feet. It can cause itching, burning, and cracked or scaly skin, especially between the toes. Protect yourself by wearing flip-flops and drying your feet well. Change socks often if your feet sweat a lot. Over-the-counter antifungal cream can usually get rid of athlete's foot. Taking a blow to the ear can kill off the blood supply to the cartilage that gives it its firm, round shape. That can cause the outside of the ear to shrivel up and look a bit like your favorite white vegetable -- cauliflower. The damage is preventable. Wear a helmet when playing contact sports -- it will protect your ears as well as your brain. You might be tempted to beef up with anabolic steroids, lab-made hormones that boost the body's muscle-building ability. But steroids can wreak havoc on a teenage body. 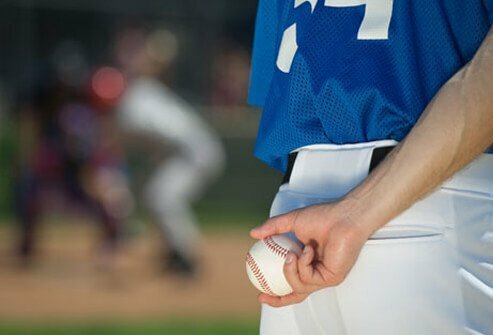 Steroid use has been linked to liver tumors, acne, violent behavior, baldness, and breast growth in teenage guys. What's more, using steroids without a prescription is against the law. Warts are rough bumps on the skin caused by a virus. Plantar warts grow on the soles of the feet, where the pressure of your body weight usually forces them flat. Pinpoint-sized dark spots in the warts are tiny, damaged blood vessels. Plantar warts can be very painful and may even interfere with walking or running. Over-the-counter products can get rid of warts, but should not be used on the face or groin. Guys are more likely than girls to get acne on the back. The back has a large number of glands that release sebum, a natural oil that combines with dead skin cells to clog the pores. Sweating a lot or using oily body products can make the problem worse. Try washing the area once or twice a day with a mild soap or one that contains benzoyl peroxide. It there's no improvement, see a dermatologist. Coarse uniforms and gear can rub your skin raw. Although chafing usually doesn't cause serious harm, it can be very irritating. Cut down on friction by using appropriate clothing and padding for your activity -- for example, cycling shorts. You can also protect areas that are prone to chafing by coating them with petroleum jelly. 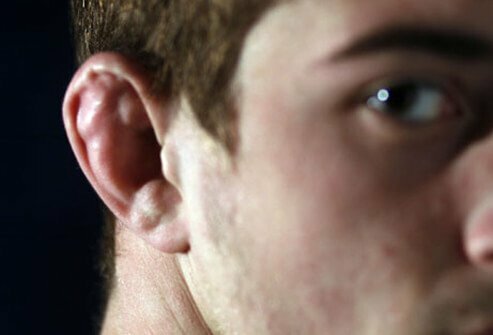 If the skin lining your ear canal is irritated or oozing a pus-like fluid, swimmer's ear may be to blame. This common infection can arise from prolonged moisture, polluted water, even clearing wax with a cotton swab that scratches the skin. Symptoms include pain, swelling, itching, and hearing loss. Antibiotic ear drops can treat it. Ear plugs and drying the ears well help prevent infection. Drops of alcohol and white vinegar may also discourage nasty ear bacteria. 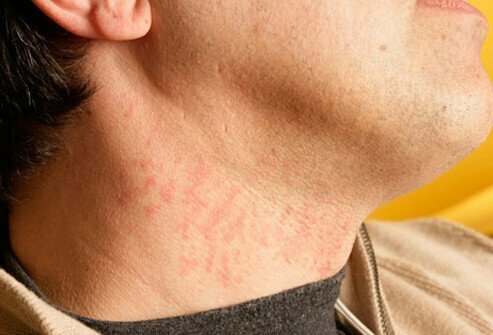 Razor burn can cause an unsightly rash and pimples on the neck -- and it doesn't feel so nice either. Shaving dry skin or shaving against the direction of hair growth are common causes. To avoid razor burn, shave after a warm shower and use shaving cream or gel. Use short, light strokes in the same direction your hair grows. If you can, wait a day or two between shaves. A pre-game powwow can be unpleasant if someone has bad breath. A top cause is taking poor care of your teeth and gums, so be sure to brush and floss regularly. Avoid cigarettes, and carry mints to freshen up in a pinch. If you have persistent bad breath despite good hygiene, see your doctor. Sour breath can be a sign of certain conditions. If you wear a helmet or baseball cap regularly, sweat and oil can build up underneath. This may cause pimples on the forehead. Be sure to wash your face as soon as you take off your cap. If the problem becomes severe, ask your doctor about acne-fighting treatments. A fungal infection on the skin can be itchy and annoying, but when it gets under the nails, it causes lasting damage. The nails become brittle, thickened, and discolored. They may crumble or separate from the nail bed. Over-the-counter creams that treat other fungal infections usually don't work on the nails. Your doctor may prescribe stronger medication or recommend removing damaged nails or trying laser treatments. 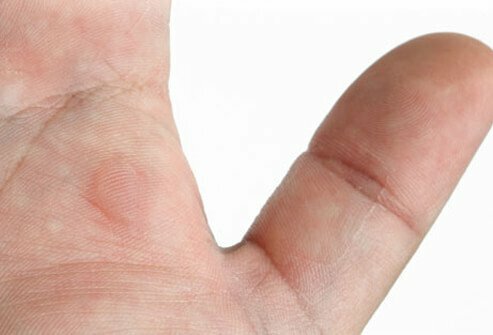 A blister is a liquid-filled bubble on the outer layer of the skin. It's caused by rubbing or pressure. You can get blisters from wearing poorly fitted shoes, from start-and-stop sports such as basketball, or sports that require equipment. Think: baseball, pole vaulting, weight-lifting, or tennis. Blisters will heal on their own. Keep them clean, dry, and bandaged. Avoid popping them. If you're a serious runner, you may get the occasional black toenail. 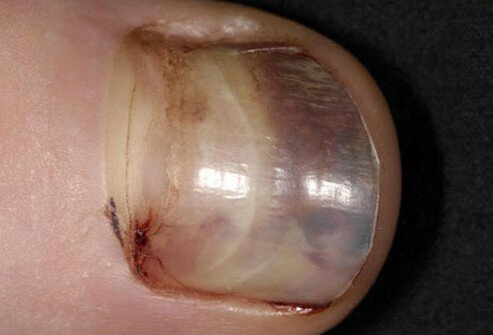 The discoloration comes from bleeding or bruising under the nail. This may happen when your toe repeatedly hits the top or front of your shoe during intense training. It's usually not painful and will heal on its own. Wearing shoes with enough toe room can help. Check with your doctor if it doesn't go away. Rarely, melanoma can appear as a black area in the nail. During puberty, the sweat glands begin pumping out chemicals that can make sweat smell stronger. 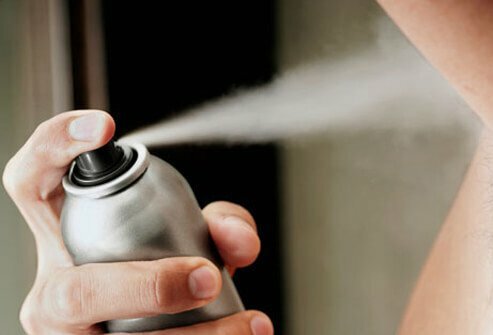 Body odor comes from the combination of sweat and bacteria on your skin. You may notice a stench around your armpits, feet, and groin, particularly after exercising. Shower daily with soap and warm water, and wash sports uniforms right after use. If you're still concerned about BO, try an antiperspirant or deodorant. The first stops sweat; the other fights the smell. Heat rash is caused by blocked sweat glands, usually from excessive sweating. 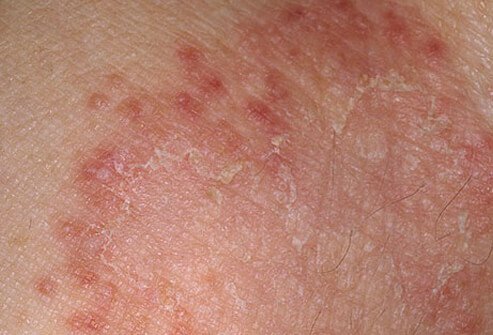 The rash consists of small red bumps that may make you itchy and uncomfortable. It's most common when the weather is hot and humid. If you develop heat rash, move to a cooler area, drink plenty of fluids, limit activity, and use a cool washcloth to soothe your skin. Stuffing sweaty pads and cleats inside your gym bag allows odor-causing germs to grow. Sooner or later, the bag and your gear will reek. To avoid this, always set your gear out to dry as soon as you get home. Stuff newspaper inside your cleats to absorb sweat. After everything dries out, spray some air freshener on your gear to cut the stench. Some young athletes have begun ordering human growth hormone (HGH) on the Internet. It's promoted as a performance enhancer, but the claims are unproven. Taking HGH can be risky -- it can cause joint and muscle problems, fluid retention, high cholesterol, and damage to the heart. Ordering HGH without a prescription is also illegal. KidsHealth.org: "Should I Worry About MRSA?" 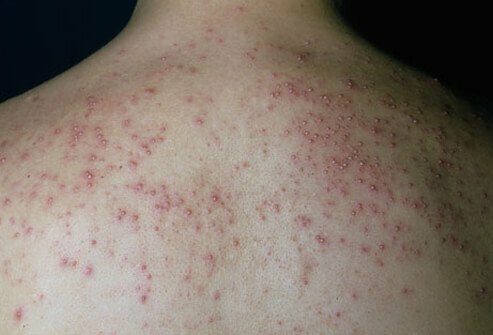 MedlinePlus:"Acne, Vulgaris on the Back." KidsHealth.org: "What Can I Do to Prevent Razor Burn?" 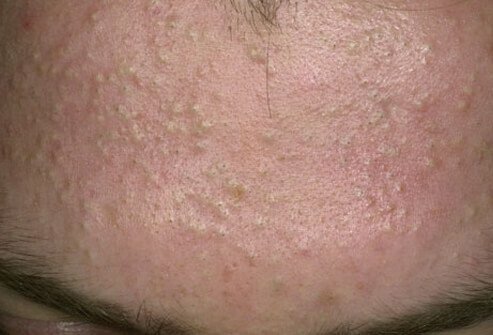 KidsHealth.org: "What Can I Do About Acne?" KidsHealth.org: "Blisters, Calluses, and Corns." 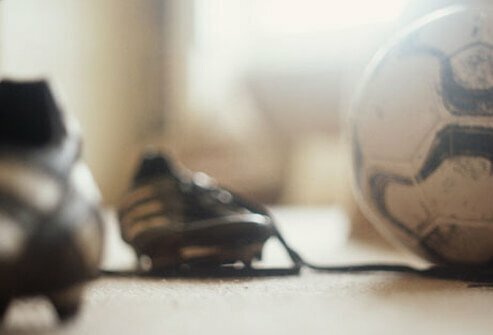 Sportsmd.com: "Proper Care and Management of Blisters." 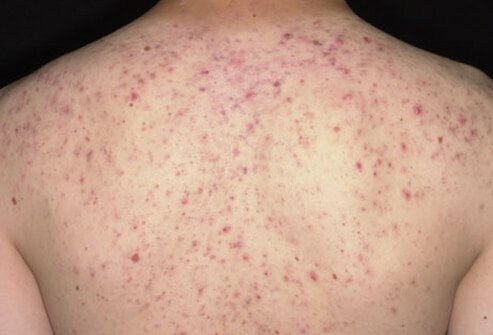 Skinsight: "Heat Rash or Prickly Heat (Miliaria Rubra)." Brian, B.P. American Journal on Addictions, 2010; vol 20: pp 9-13. HarrisonG. Pope Jr., MD, director, Biological Psychiatry Laboratory, McLean Hospital, Belmont, Mass. BarrySears, PhD, president, Zone Labs Inc., Marblehead, Mass. HaroldC. Urschel, MD, author, Healing the Addicted Brain. KidsHealth.org: "Are Steroids Worth the Risk?" The Hormone Foundation: "Growth Hormone: Use and Abuse." THIS TOOL DOES NOT PROVIDE MEDICAL ADVICE. It is intended for general informational purposes only and does not address individual circumstances. It is not a substitute for professional medical advice, diagnosis or treatment and should not be relied on to make decisions about your health. Never ignore professional medical advice in seeking treatment because of something you have read on the MedicineNet Site. If you think you may have a medical emergency, immediately call your doctor or dial 911.